Over the past few months we have posted short Meet the Staff videos to our Facebook and YouTube pages. These videos help users like you to get to know the members of our team. They were shot with Sony cameras and edited using Movie Studio Platinum 12. In this article, I want to focus on Episode 5: Introducing Kevin of the Meet the Staff video series and explain how to easily create a title sequence, lower third, and picture-in-picture effect similar to those seen in the episode. Watch the fully edited Episode 5 here and download the Movie Studio Platinum *.vf project file, along with the project's corresponding media, by clicking here. 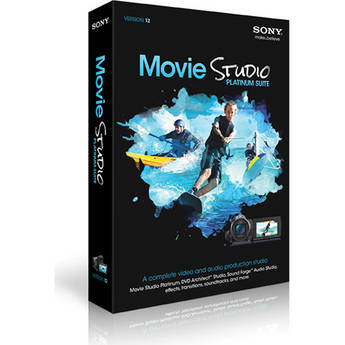 Includes Quick Looks "Film Looks"
To start, open two instances of Movie Studio Platinum 12. We'll view the already-created sections in one instance and re-create those sections in the other. In the first instance of Movie Studio Platinum, open the Meet the Staff .vf project file and play it back from the beginning to view the opening sequence. In the second instance of Movie Studio Platinum, click the Media Generators tab, select (Legacy) Text from the list of generators, and drag the Default Text preset to the first track on the timeline. 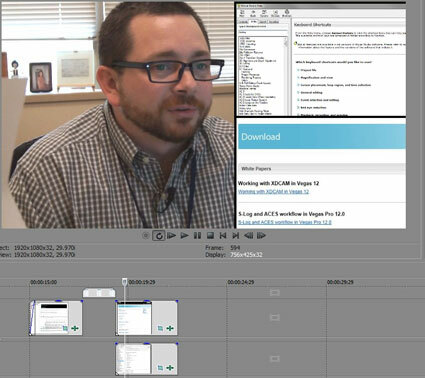 Figure 1: In the Video Media Generators window, delete "Sample Text" and type the text you want the viewer to see during the video intro. In this case, type "Meet the staff of". Now, in the Video Media Generators window delete the "Sample Text" and type "Meet the staff of" instead (as seen in Figure 1). Set the font size to 26. Click the Placement tab and move the text to the desired location. In this case, I moved the text to the right, but kept it centered on the vertical axis. Close the Video Media Generators window. We'll now make a copy of the text event that we just created. Click the text event on the timeline, then hold the Ctrl key and drag the text event to the right on the same track. In the Paste Options window, select the Create a new copy of the source media radio button. Click OK. This creates a copy of the original text event with all of the font, size, and placement attributes, but allows you to create new text without affecting the original text event. Click the new event's Generated Media button and change the text in this event to change the text to "Sony Creative Software". Now drag the second event until it snaps to the right edge of the first event. In the same way, create a third text event with the text "Episode 5: Introducing Kevin". Drag this event until it snaps to the right edge of the second event. Point to the upper right-hand corner of the third event and when you see the Fade Out Offset ToolTip appear, drag it to the left to create a fade out. Now point to the upper left-hand corner of the first event. When you see Fade In Offset ToolTip appear, drag to the right to create a fade in. From the Media Generators list, select Solid Color. Drag the Magenta preset to the second track on the timeline. 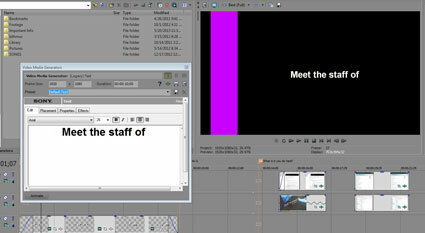 You'll notice that the color change in the Meet the Staff project file is animated. To animate the color change, click the Animate button. In the keyframe controller area, double-click at the end of the Color lane to add a key frame. Next, select a different color from the Color drop-down list. Now play your project. When it plays through the Solid Color media generator event, it changes color over the duration of the event. Click the Track Motion button on the Magenta track's track header. 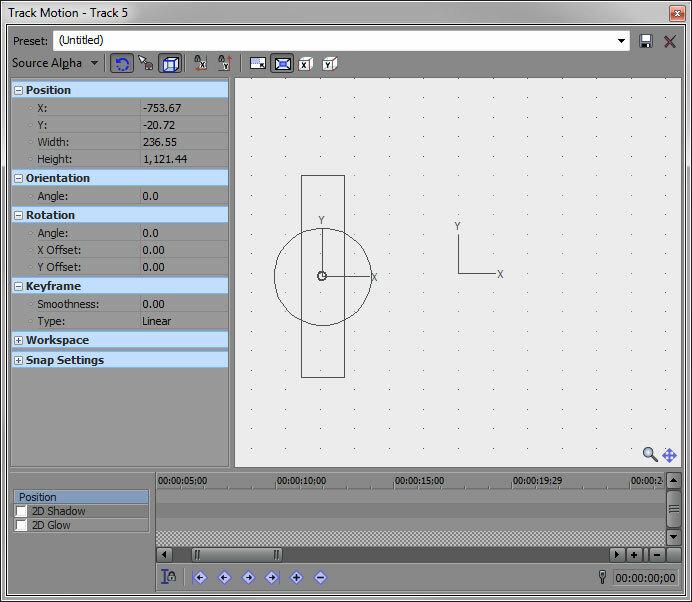 In the Track Motion window, click the Lock Aspect Ratio button to disengage it. Drag the lower right-hand corner of the position rectangle until it is a thin, vertical strip (as shown in Figure 2). Keep an eye on the Video Preview window as you drag the strip to the left until the strip appears where you want in the frame. Play your intro and make any necessary tweaks. 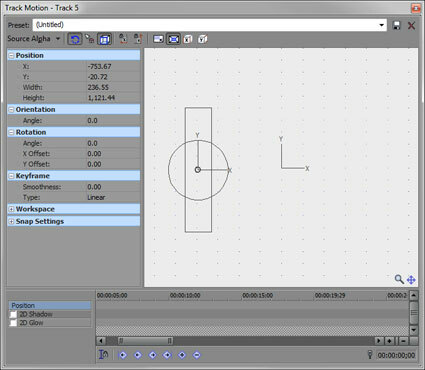 Figure 2: Drag the lower right-hand corner of the position rectangle in the Track Motion window towards the lower left-hand corner to reduce the width of the solid color event. When Kevin's interview first begins, his name appears across the bottom of the screen. This is called a lower third. To create the lower third, select (Legacy) Text in the Media Generators window, and drag the Default Text preset to the timeline. Add the name of the interviewee, (Kevin, in this case), change the size of the font to 32, and select the Placement tab in the Video Media Generators window. Place the text in the lower left-hand corner of the screen. Now select Solid Color option from the Media Generators list and drag one of the presets to a track below your text track on the timeline. Click the Color drop-down list to make a more specific color selection. Click the Track Motion button on the track header. Drag one of the top corners of the position box down to form a long, horizontal rectangle. Move the rectangle until the color strip appears in the Video Preview window, under the text you added earlier. Create a fade in on this event. Do the same thing for the color event on the track below. Create a fade out at the end of your lower third events. Repeat these steps to create a fade out on the color event, as well. To create the picture-in-picture effect that appears near 00:00:15 in the video, drag two photos or videos from the Explorer window to the timeline. Position the newly added media on two different tracks, one directly above the other, as shown in Figure 3. Make sure that the core video (the interview, in this case) is on a third track, directly below the other two. Any image on track one will cover any image directly below it on other tracks. This means that we'll need to resize and reposition the insert media so the main video appears in the Preview Window, as well. Figure 3: To create a picture-in-picture effect, position your two (or more) video events on separate tracks, one event directly above the other. To resize the event, click the Track Motion button on the track header of the track you're working in. If you still have the Lock Aspect Ratio button disengaged, engage it now before moving on. With the Lock Aspect Ratio button engaged, the event you're working with will maintain its height and width proportions even when you increase or reduce its overall size. Drag the corners of the rectangular position box towards the center of the box to make the image smaller. To position the event, drag the position box to place the video anywhere inside the frame. Keep an eye on the Video Preview window to see exactly where you are positioning the media. Repeat steps 2 and 3 for sizing and positioning the event on track two. In the interview, I added borders around the inset images. To do this, click the Event FX button on the event located in the top track. Select Sony Border from the Plug-in Chooser, then click Add and OK. In the Border FX window, move the Hue slider to black to change the color of the border. Then drag the Size slider to the right to make the border thicker. Repeat these steps to add a border around the event on the second track. By now I hope you have realized that it is quite easy to employ editing techniques that give your finished movie an interesting and professional look, using Movie Studio Platinum. Perhaps you will even use these techniques in your next project. Thanks for reading, and keep creating! Written by Whitney Jacobson; Product Manager of Movie Studio Platinum. For more training resources, including free videos, webinar archives, and tutorial article archives, visit our training page at www.sonycreativesoftware.com/training.